初日の朝、多少緊張気味　First morning, a bit nervous. Penang Japanese School decided not to take trial children for year 1 for this term. We decided to send Aratakara to a school in Japan. We went to Japan for 2 weeks immediately after SCIPS finished. If the school takes a trial child or not totally up to the school. When my father rang Osato Higashi Primary School, where I used to go, the deputy headmaster accepted our request. The school is only 3 minutes walk from my parents. We have sent Arata to Penang Japanese School for a couple of times. Although the school is partially funded by the government, it's still a private school, and they charge us school fee. Of course, local schools in Japan are free. We only have to pay for the school lunch and some sort of insurance, then off they go. On the first day, we met a group of children, with who Aratakara are going to go together, at 7.50 in front of my parents' house. 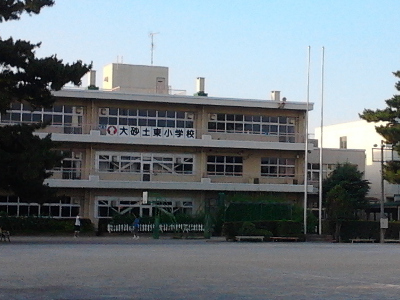 Then I took them to school a bit later to meet deputy head master, Inoue Sensei. Soon after, Terada Sensei of Year 1 Class 4 and Tanabe Sensei of Year 3 Class 5 came to meet us and take boys to each classroom. A lot of "first" experiences for Ararakara. 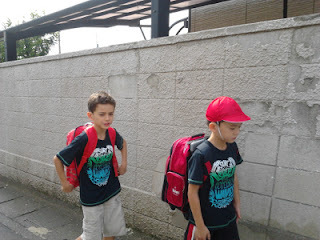 They have to change their shoes to Uwabaki, shoes inside of the school, they go to school by themselves wearing a red and white hat, they are provided with school lunch..... All of these are very normal for me, but for my children, everything is new.